For almost 1800 years, wine has been produced in the present-day area of Germany. Roman viticulture is thought have been prevalent in the region surrounding Trier (Germany's oldest city) which is situated directly on the Moselle (Mosel) River, today an important viticultural area. In terms of production, Germany ranks about 8th in the world. It's total area of vineyard is about 103,000 hectares, roughly a tenth of any of the top three producers (France, Spain and Italy). This vineyard area can be broken up into 13 wine regions for "Quality Wine". These 13 regions can be further broken down into several sub-regions and collections of vineyards. For the sake of brevity and not to overload us all with information we shall focus on just the main 13 main regions (Anbaugebiete). Almost all of these regions lie on the western side of Germany in and around the Rhine river valley and surrounding tributaries (the main exceptions being Saale-Unstrut and Sachsen/Saxony). Located on the river Ahr, a tributary of the river Rhine, Ahr is one of Germany's smallest wine regions with less than 600ha under vine. Situated rather far north , red wines account for over 85% of Ahr's production, higher than any other German wine region. It is believed that the Ahr river valley was planted in Roman times, however the earliest credible documentation shows wine production was at least established before 893A.D. Baden is Germany's southernmost wine region and as such is actually the warmest wine growing area in the country. Baden is well-famed for it's wine of the Pinot family; Pinot Noir (Spätburgunder), Pinot Gris (Grauburgunder) and Pinot Blanc (Weißburgunder), with these three varieties making up over 55% of all plantings. Other main plantings are Riesling, Müller-Thurgau and is interestingly the only German region able to grow significant amounts of Chasselas (Gutedel). Baden wine region is defined as separate from the wine region of Württemberg even though they both belong to the state of Baden-Württemberg. Franken is the only wine region situated within the state of Bavaria, lying in the north west of the state. 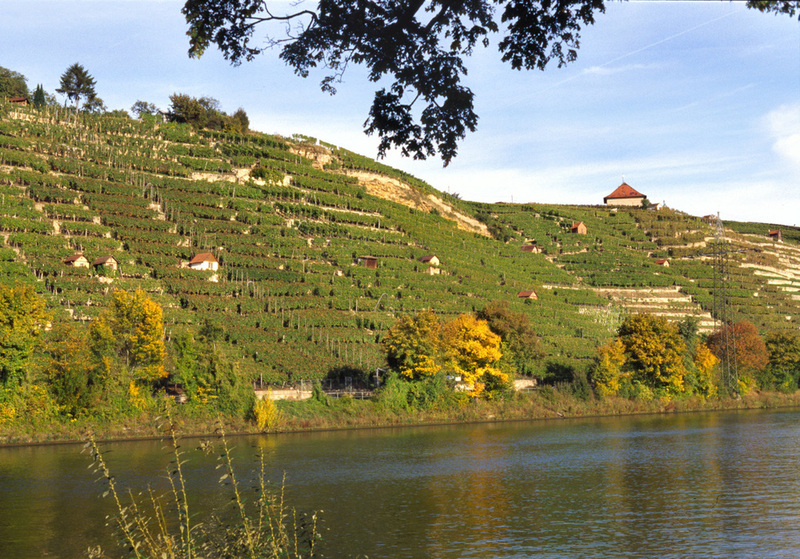 This wine growing district is mainly situated along the Main River, especially near Würzburg and produces wines that are especially well known for their minerality due to unique soils some of which contain high quantities of Gypsum. Other areas contain soil which consists of red sand stone which is excellent for some red grapes (most notably Frühburgunder, an early-ripening mutation of Pinot Noir). Franken wine region contains over 6,000 hectares under vine. This area is also unique for the special wine bottle named "Bocksbeutel" the shape of which is also seen in some Portuguese wine bottles. The well known 85ha 'Würzburger Stein' vineyard on a hill outside the city of Würzburg. The traditional 'Bocksbeutel' wine bottle of the Franken wine region. Hessische Bergstrasse is Germany's smallest wine region, with under 450 hectares of vineyard area and is located along the Northern and Western slopes of the Odenwald mountain chain. This wine region is dominated by white varieties (80% of plantings) with Riesling taking up roughly half of all vineyards in the district. Interestingly the majority of Hessiche Bergstrasse's wine is produced by a winemaking co-operative based in the city of Heppenheim, to which over 600 of the region's roughly 850 growers of the region deliver their grapes. Due to small production, most of Hessiche Bergstrasse's wine is sold locally, so it would be rare to find wine from this region outside of Germany. Vineyards near the town of Bensheim. Mittelrhein is a small wine region completely over-shadowed by it's famous neighbours. This region is located in the middle section of the German area of the River Rhine, mostly between Rheingau and Mosel. Though Riesling accounts for nearly 70% of this regions plantings, the area's wines have never enjoyed the popularity held by it's neighbours. It does see a large number of tourists as this part of the River Rhein is well known for it's beauty. 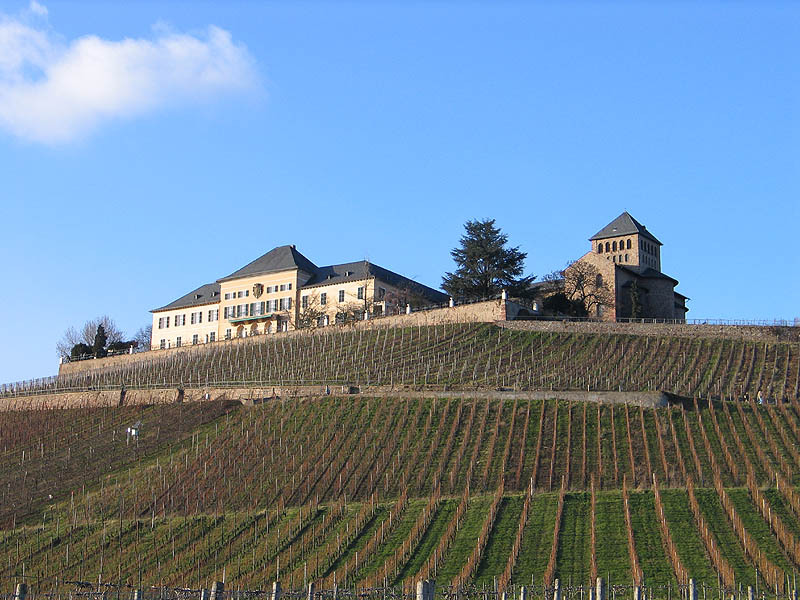 Stahleck Castle with surrounding vineyards. Mosel has just over 9,000ha vineyard area, making it the 5th highest planted wine region in Germany. Despite this, one could easily argue that Mosel is the most famous region in the whole country. Mosel covers the valleys of the three rivers, Mosel, Saar and Ruwer, and these valleys contain many of the world's steepest vineyards. 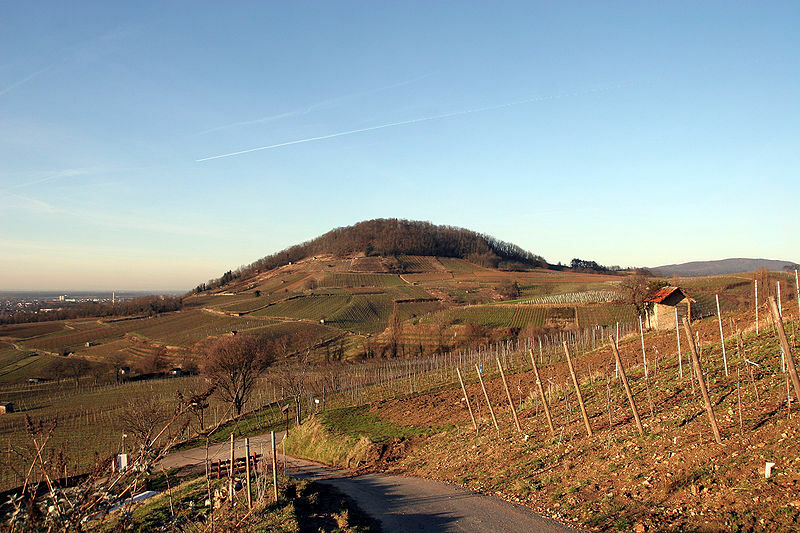 At 65° incline, the 'Calmont Vineyard' belonging to the village of Bremm (Bremmer Calmont), is recorded as the the steepest vineyard in the world. Mosel Rieslings are often crisp and light, with low alcohol and high acidity, often noted for their flowery aromas. Mosel was planted by Romans around the outpost of Trier (founded 16BC) sometime in the second century. The wines of the Middle Mosel are considered the most age-worthy wines in Germany, and are able to age gracefully in excess of 50 years in some cases. Bremmer Calmont approaches an almost vertical incline. Transport and planting on the side of Bremmer Calmont. The full extent of the amazing Calmont Vineyard. The River Nahe region was one of the last German regions to develop sizeable plantings, being planted nearly six centuries after the Romans planted the nearby Mosel region. As with many of the wine regions in this part of Germany, Riesling is the most populous planting (over 27%) with white varieties dominating over reds at over 75% of total plantings. Most Nahe vineyards are located on steep slopes typically at elevations of 100-300 metres. River Nahe runs parallel to River Mosel and lies 40km South-East of the Mosel wine region. Nahe is surrounded by Mittelrhein to the North, Rheingau to the North-East and Rheinhessen to the East. Nahe's vineyard area is just over 4,000 hectares. Pfalz is the second largest wine region in Germany after Rheinhessen at 23,500 hectares of vineyard area. The climate of Pfalz is similar to Baden in Southern Germany and also to Alsace with a warm, sunny and very dry climate for a German wine region. 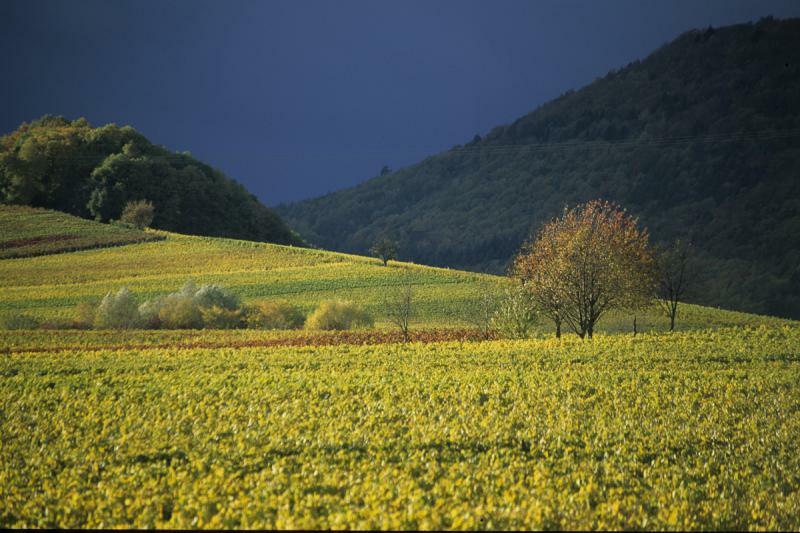 This region is situated in the lee of the Palatinate Forest on the Haardt Mountains, which in themselves are a continuation of Alsace's Vosges Mountains leading to a similar overall climate. Again, Riesling holds the largest amount of vines in this wine region, with Dornfelder and Müller-Thurgau in second and third. Interestingly something unique to this area is a custom of serving wine in a mix with sparkling water to make a popular refreshing drink called "Schorle". 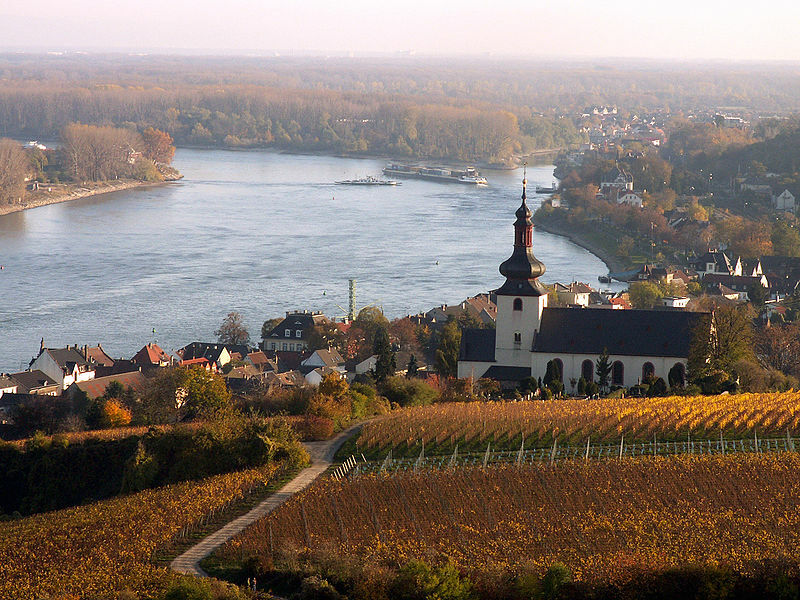 Rheingau is another smaller wine-growing area of Germany, only comprising about 3% of the total vineyard area. This area has however contributed many important developments that have brought about much of Germany's favourable reputation as a wine-growing country. Rheingau is almost entirely Riesling with roughly 80% of the region's planting consisting of the one variety. One of the most famous and influential Rheingau wineries is 'Schloss Johannisberg' which was a very early adopter of Riesling and was the site where the German form of noble rot was discovered by accident. Rheingau has roughly 3,150ha under vine. The historically important 'Schloss Johannisberg' which was an early adopter of the Riesling variety for which Germany is now famous. Rheinhessen is the largest of the 13 regions and one of the regions that has vastly improved when it comes to quality wines. Rheinhessen now has 26,500ha of vineyard area and has historically been a big part of the erosion of the image of quality German wine, mostly due to Liebfrauenmilch (a semi-sweet wine style produced in many regions). The most famous Liebfrauenmilch brand was 'Blue Nun' which many of you may remember. Nowadays, no quality producer in Rheinhessen would even think about producing this style. Müller-Thurgau (the prime ingredient in Liebfrauenmlich) is still most planted, but this variety is declining every year. Riesling is now taking prominence, with Dornfelder and Silvaner not far behind it. The most well-known area for white wines is an area called the "Rhine Terrace"(Rheinterasse) which itself is bigger in area than the entire of the Rheingau wine region. One interesting part of the Rhine Terrace, between Nackenheim and Nierstein is known as the Red Slope (Roter Hang) because of the presence of red slate in the soil there. Germany's most northerly wine region, Saale-Unstrut is located on several hill sides around the rivers Saale and Unstrut in former 'East Germany'. Saale-Unstrut has just under 700ha of vineyard area, making it one the smaller wine-growing regions in Germany. A decent history of winemaking is present in this area with the wines of Memleben Abbey mentioned in literature in the year 998A.D. Because this area is much cooler than other German wine regions, varieties such Müller-Thurgau and Silvaner (which are deemed lower quality in many other regions) are thought to perform their best in Saale-Unstrut's climate. Vineyards on the slopes beside River Unstrut. Sachsen is Germany's third smallest region and is the other wine region located in former 'East Germany'. More than doubling it's vineyard size after the German Reunification in 1990, the vineyard area is now around 450ha. This area does have a long history of viticulture going back as far as 1161. Sachsen is located in South-Eastern Germany near the border with Czech Republic, and it's soils are very similar to Austria's Wachau region, being mostly composed of gneiss and granite. Müller-Thurgau and Riesling are the dominant varieties with almost all wines in this area being made in a dry style. A footpath through a Sachsen vineyard in the village of Pillnitz. Württemberg is a significant wine-growing area in Germany as the fourth largest area with over 11,500 hectares of vineyards. The majority of this wine region is situated around the river Neckar and it's tributaries with a small amount of vineyards also being located on the shores of Lake Constance (Bodensee) near the vineyards of Baden. Most of this area consists of river valleys and south-facing slopes, especially between the cities of Stuttgart and Heilbronn. Unlike other German wine-regions, Württemberg has a significantly longer history of producing red wines, most notably from it's signature variety: Trollinger ( a German/Italian grape, originally grown in South Tyrol and Trentino). Trollinger is almost exclusively grown in Württemberg now and produces a light bodied, slightly smoky red wine. Other common red wines are Schwarzriesling (Pinot Meunier), Lemberger (Blaufränkisch) and Spätburgunder (Pinot Noir). The well-known Cannstatter Zuckerle vineyard situated in terraces on the river Neckar, is in Bad Cannstatt, a part of Stuttgart. With our 13th and final wine region, our overview of the main wine-growing areas of Germany is over! I hope you have learnt a lot about German wine today, and perhaps we shall delve into the detailed sub-regions of these complex areas together in the future! Happy studies and if you have a region you would like to learn about, please contact me.